A large minor variant canker sores. This lesion was treated with a dentist-dispensed sulfuric acid/phenolic compound, which helped alleviate the pain. After evaluating her diet, this patient switched to a toothpaste which did not contain the common foaming agent, sodium lauryl sulfate (SLS) and noticed that she stopped developing canker sores. Canker sores (aphthous ulcers) are a type of mouth sore which commonly arises on the unattached mucous membranes inside the lips and cheeks, on the sides of the tongue, and floor of the mouth. 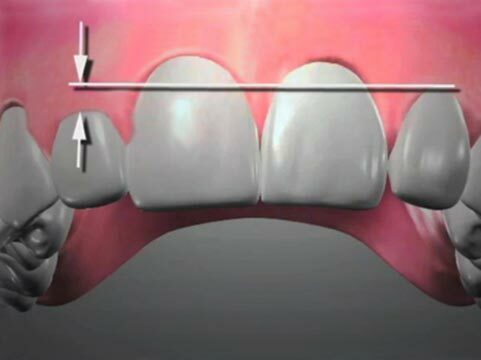 They are not commonly found on the attached, keratinized gingival tissues that surround the teeth. Canker sores are characterized by red borders with a yellow-grey center, and are typically very painful. Those that are smaller than one centimeter in diameter are considered minor variant apthae, while those greater than one centimeter are considered major variant subtypes. Aphthous Stomatitis is a term for multiple affected sites. 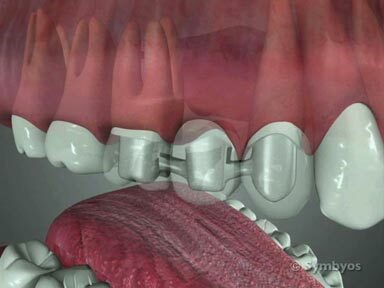 It is very painful and can be temporarily debilitating, leading to problems with speech and eating. Canker sores have a tendency to recur in many patients, producing a diagnosis of Recurrent Aphthous Stomatitis (RAS). The term Sutton’s Disease is also used for major variant apthae, which may take longer to heal (up to 30 days) and can produce scarring. Canker sores may be caused by the body’s immune system. Deficiencies of certain vitamins, including B9 (folic acid) and B12 (cobalamin) have also been suspected. The foaming agent sodium lauryl sulfate (SLS), commonly found in toothpaste has also been implicated. They are one of the most frequently encountered mouth sores, especially in women. 15% to 20% of the population suffer from them. Generally, they are self-limiting, meaning they resolve on their own without treatment; however, the painful symptoms can be treated with over-the-counter or prescription medications. Herpetiform aphthous ulcerations are simliar to minor variant apthae, but are generally smaller (2 millimeters or less) and more numerous (up to 100 may be present at any time). 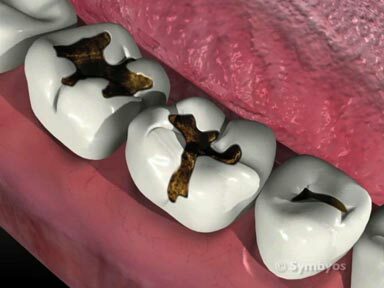 How does the dentist diagnose Canker Sores? The dentist performs an examination of the affected tissues, and arrives at a diagnosis on the basis of the lesion’s location, appearance and history. It is important to distinguish canker sores from herpetic lesions, which are commonly called cold sores or fever blisters). Cold sores are of viral origin. Treating cold sores with steroid ointments or medications can cause the condition to worsen, as steroids inhibit the body’s immune response. Canker sores may be distinguished from cold sores in several ways. Cold sores most commonly form outside the mouth, typically on the lips. When they occur in the mouth, they are usually found on the attached, keratinized (thick, durable) soft tissues on the hard palate and around the necks of the teeth. They are generally smaller in diameter than canker sores, and form blisters before ulcerating. Patients with ulcerations which do not heal should be evaluated to rule out malignancy. Dentist-dispensed topical treatments are available and can effectively eliminate the painful symptoms of aphthous ulcers. Some use sulfuric acid/phenolic formulations to chemically cauterize the lesions. Steroid ointments and medications can be prescribed to suppress the immune response if the diagnosis is certain. The “repair” vitamins (vitamin C, vitamin E) and Co-enzyme Q10 (CoQ10) may promote accelerated healing. Antibiotic rinses may be of some benefit, but may lose their effectiveness across multiple episodes of recurrence. If treatment is ineffective, it may be necessary to obtain a tissue sample for microscopic examination, known as a biopsy. Only your dentist or physician can diagnose the need for a biopsy.